The combination of art and technology takes a great part in the current work of artists. Many artists have used technology to enhance visual language in artworks to convey their intended meanings. Gregory Crewdson is a famous American photographer who is best known for elaborately staged, surreal scenes of American homes and neighbourhoods. Crewdson's photography is often described as cinematic and each image operates as a compacted drama, with the significance spread between various visual points within the image. (Kitamura K. 2008) The use of technology visually enhanced Crewdson's body of work, depicting surrealist views of provincial American lifestyle. Crewdson also enhanced visual language used in his works by using technology. A good example is in one of Gregory Crewdson's series of work; 'Beneath the Roses' which is a body of work composed of twenty large-scaled photographs. Crewdson uses constructed backgrounds, computer graphics and digital manipulation to blur the distinction between reality and fiction. (Gregory Crewdson Retrospective) He upsets all our traditional ideas about truth and reality in photography. Crewdson’s confusion over the validity of the memory is the epitome of his artworks. (Seven 2008) Crewdson is not interested in before or after but the very still moment in taking shoots. He has two distinct ways of taking a photo, either on a sound stage or on location. The use of constructed background and lighting in order to create the perfect atmosphere is the common and most important part of visual language, which Crewdson focuses on. Today, where things are mostly not achievable without using technology, Crewdson has used surrealist devices in his work with the support of technology such as lighting, computer graphics and Photoshop. In 'Beneath the Roses', meaning is communicated using visual language and media, which is enhanced by digital technology. The works are epic in scale and intimate in scope, these visually breathtaking photographs blur the distinctions between cinema and photography, reality and fantasy, what has happened and what is to come. (Muente L.T. 2008) Lighting in his work greatly impacts on one of the most important elements of visual language, colour. He uses light and colour to tell a story, to take an everyday situation and transform it into something cinematic and theatrical. 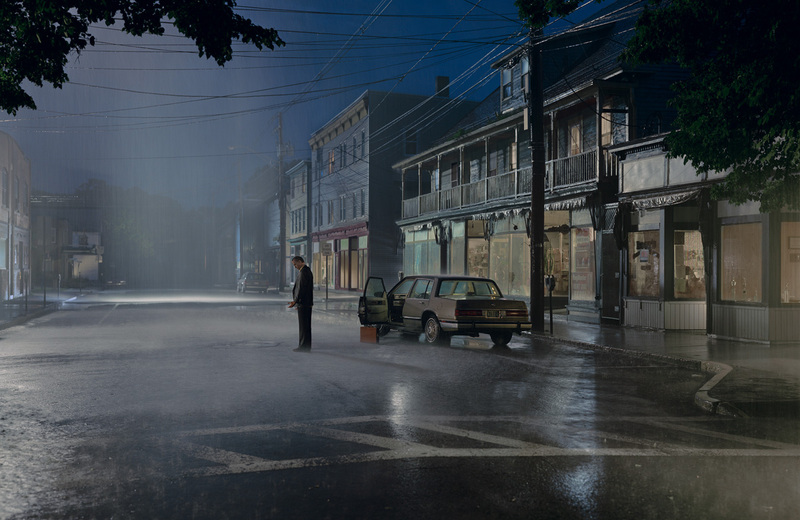 Crewdson’s use of light and colour manipulates greatly in creating the atmosphere of his work. Crewdson uses a variety of lighting sources, such as operating lighting experts, trying to create the typical American neighbourhood. Crewdson loves the experience of cinema- being enveloped in a complete world of another imagination. (Whewell 2008) He loves the quality of film as how it can capture so richly the colour and light of a scene. But Crewdson most loves photography for “What it leaves unsaid, for it is from this that we can start to spin our own imagination.” Therefore, in his body of works, he combines the three qualities to create his inspirational artworks. Crewdson tries everything in order to achieve absolute clarity in a photograph. (Focal Point: beneath the roses) He creates symbolism as the smallest details have important meanings. For example in the work Ophelia (2001), a woman is dressed only in a white slip, floats on the surface of the water submerging her living room. It isa modern day suburban Ophelia (2001) completed with settee and out-of-date wallpaper patterns. (Whewell 2008) The title of the work contains an important meaning, as Ophelia is one of the characters that drown herself in the play 'Hamlet'. The use of out-of-date wallpaper creates the atmosphere of a modern day American suburban housewife, bringing Ophelia into the twenty-first century. The use of lighting technology creates a surrealistic view of the woman half floating on water. 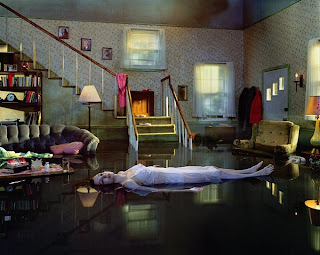 The nature of photography in Ophelia (2001) is that Crewdson has captured the momentary scene of the drowning woman, which leaves the ending to the viewer’s imagination. Another work, which significantly portrays Crewdson’s intension in one of the series of ‘Beneath the Roses’, is Untitled (boy with hand in drain). The artwork consists of a boy in the center of a bathroom, reaching down into the drain. The work is constructed to see two different scenes, the upper atmosphere of the bathroom and the underneath space for the drain. The use of lighting and computer graphics enhanced the visual language in order to conveying his intended meaning. The dark, empty space visible below the floor and the dramatic light streaming in the window turn what at first appears to be a mundane domestic scene into an unexplainable moment in an unknown narrative. (Bayles J. 2010) The combination of light and dark tone works very well in this work as it creates an atmosphere of day and night in one scene. Crewdson makes rather then takes his photographs, exposing the dreams, anxieties, fears, and desires that underlie everyday life. "I'm completely invested in the idea of trying to make the image as beautiful, as mysterious and as powerful as possible. The technology allows me to reproduce exactly what I envision". In his work, he explores the narrative powers of photography; how much of a story can be compressed into a single image? (Gregory Crewdson Retrospective) "Though technology is only the means through which a photographer's vision is revealed, it has dramatically changed what an individual artist can do, I am absolutely thrilled to know that I can now make all my final prints in my studio while maintaining control over the entire process. "(Focal Point: beneath the roses) Technology allows the artists to engage more clearly in expressing their intention to the viewers. Also it enhances visual language in the work, which make the artists easier to construct a perfect work. Another important quality is the emotional response of the viewers. In Crewdson's work, the photographs portray emotionally charged moments of seemingly ordinary individuals caught in ambiguous and often disquieting circumstances. (Beneath the Roses) The emotional meaning behind the work and the important source of inspiration lies in Crewdson’s youth. (Gregory Crewdson Retrospective) As the child of a psychotherapist working from home, he soon learned that each individual experiences reality in his own way. His 'craziness' as he calls it and the shoots engage the audience to see the surrealism in his works. Crewdson's photographs provide the unarguably compelling experience of seeing beyond the ordinary into a deeper psychological state. (Focal Point: beneath the roses) The audience is able to engage emotional responses through the use of visual language enhanced by technology. Gregory Crewdson assists technology in creating photography which blurs the distinction between reality and narrative. He combines cinematic features of creating another complete world of imagination, the film quality of capturing the rich colours and light of a scene and photography, leaving the end to the viewer’s imagination. By using technology in artworks, it creates a bridge which allows the viewers to get closer in interpreting the artist’s intending meaning behind their works. Gregory Crewdson is a famous American photographer who is best known for elaborately staged, surreal scenes of American homes and neighborhoods. Crewdson's photography is often described as cinematic and each image operates as a compacted drama, with the significance spread between various visual points within the image. The use of technology visually enhanced Crewdson's body of works, depicting surrealist views of provincial American lifestyle. Crewdson also enhanced visual language used in his works by using technology. A good example is in one of Gregory Crewdson's series of work; 'Beneath the Roses' which is a body of work composed of twenty large-scaled photographs. Crewdson uses constructed backgrounds, computer graphics and digital manipulation to blur the distinction between reality and fiction. He upsets all our traditional ideas about truth and reality in photography. Today, where things are mostly unachieved without using technology, Crewdson has significantly portrayed surrealism in his work with the support of technology. His 'craziness' as he calls himself and the mystery shoots engage the audience to see the surrealism in his works. Crewdson's photographs provide the unarguably compelling experience of seeing beyond the ordinary into a deeper psychological state. (Focal Point: beneath the roses) The audience is able to engage emotional responses through the use of visual language enhanced by technology. Today, surrealism takes a great part in visual art. Crewdson has combines his use of technology in order to create surrealistic artworks. Gregory Crewdson is a famous American photographer who is best know for elaborately staged, surreal scenes of American homes and neighborhoods. Crewdson’s photographs are often described as cinematic, and they layer David Lynch’s surreal dread over Alfred Hitchcock’s snap-trap narratives of suspense. Each image operates as a compacted drama, with the significance spread between various visual points within the image. It is between these points that a density of meaning and narrative is constructed; in this sense, Crewdson references classical ideas of symbolic representation that are located in painting rather than cinema, or even photography. "I think I always have been drawn to photography because I want to construct a perfect world. I want to try to create this moment that is separate from the chaos of my life, and to do that I think I create enormous disorder. And I like that craziness because I think that it creates almost a sort of neurotic energy on the set, and through that there is a moment of transportation. And in all my pictures what I am ultimately interested in is that moment of transcendence or transportation, where one is transported into another place, into a perfect, still world. Despite my compulsion to create this still world, it always meets up against the impossibility of doing so. So, I like the collision between this need for order and perfection and how it collides with a sense of the impossible. I like where possibility and impossibly meet." Gregory Crewdson expresses meaning through iconic photographs. His surreal, cinematic images are elaborate studies on mood and uncertainty. One of his famous piece 'Ophelia', contains a woman in a white slip floating face up in a flooded room. This work is based on William Shakespeare's play 'Hamlet', as the title of this work is Ophelia, a fictional character in the play. She is a young noblewoman of Denmark, the daughter of Polonius, sister of Laertes, and potential wife of Prince Hamlet. The work portrays the doubtful death by drowning of Ophelia. Varieties of colours are used in the artwork and the bright lights reflects the water as black, like a black hole. The impression of this piece at first sight is very intensive and gives a paranormal feeling. A man is standing beside his car, in the rainy street. The man is looking down at his feet, but he doesn't seem wet from the rain. The colour scheme of this work is uses cool analogous colour schemes. The main mood of the piece is loneliness.Gregory expressed through the Middle American settings, the obsessions and desires that lurk beneath everyday lives. I think she has it all and yet she has cried a thousand tears and now she is sinking in her loneliness. The art work expresses sadness through the climate of rain, and the loneliness as the man standing in the middle of the work is looking down with his hands out showing a guilty emotion. it is kept within the dark range of colours, there are no people around him, it looks like an empty and quiet town. Ophelia has the mood of loss, everything is ruined as the objects in the house is half wet, the women who is on top of the water looks as if she has no soul and is broken inside. It is a depressing art work, and a little disturbing in away, that it is so creepy. actually the women looks like shes dead.. This film still again gives off a feel of surrealism and a mood of uncertainty. The image provides an isolated feeling again as the image provides an alluring and imaginative thought in the audiences mind. Because the image looks like its a film still, it gives off an imaginative, but intense narrative. As the audience can some what grasp an understanding but is lost through the surrealism and paranormal of the image. Because Crewdson plans significantly ahead of what the film still will be, it conveys an experience that is intensely real. Again the image focuses on a classical american landscape with a surreal twist. Crewdson is able to use special effects to portray his message. but this photo is more...contemporary stylised..i suppose.. It seems that finally the drought has broken and his wife, who died on that same road, is not here to bathe in the glory of this rain with him at the end. This first image brings across a very intense and paranormal feel. From the image it shows quite a psyche feel from the darkness of the landscape and the emptiness of the streets besides the one man in the middle of the road. The image itself I get a feeling of a stormy night, in a deserted town where the business man holds out his hand in a very mysterious way. The emotion i feel from the man is as if he had a purpose of destination however had spiritual or very theatrical thought. Because Crewdson produces film stills, this gives off a classical interpretation of American life. This image is also quite alluring but also confusing as the time and place isn't known and the landscapes are realistic with imagination twisted in. another strange thing is...is it actually raining in the picture?? - the man has 'placed' his briefcase and walked..quite far away from the car and is standing tall...im accentuating the 'placing' of briefcase coz if u were sad or angry u would probs thrown or dropped his briefcase rather than placed. Also the fact he walked away from the car shows independent-ness...maybe..and the fact that he is standing very tall..like a pencil. This reveals his personal self-confidence? his not slouching or anything. And his hand out at the front symbolises..openess..
Gregory Crewdson's series of work, 'Beneath the Roses' is a body of work composed of twenty large-scaled photographs. Crewdson has used numerous actors, camera effects, lighting to create the work. In this body of works, sense of intense loneliness can be depicted as most the works are dark and the mood is heavy. Crewdson tried to express the beneath emotions of a person, which can be seen as a personal secret. He used light and colour to tell a story, to take an everyday situation and transform it into something cinematic and theatrical.